Sometimes you need visual aids to convey your message, and Office 2011 for Mac can help you there. SmartArt graphics are sophisticated design combinations of shapes and text used to present data that you can customize quickly. When you click the SmartArt tab on the Ribbon, the leftmost group is Insert SmartArt Graphic. 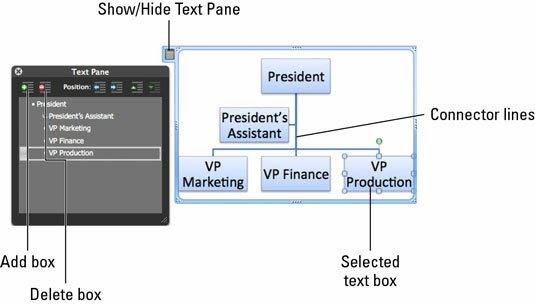 Here you find several buttons that represent various types of SmartArt graphics. Hold the cursor over any of these buttons to reveal a tooltip with suggestions about how you might use them. Determine where the SmartArt will be inserted in the file. In Word, click in the document to make sure the insertion point is right where you want it. For Excel, select a cell. For PowerPoint, just make sure that the slide where you want to insert the SmartArt graphic is the active slide. 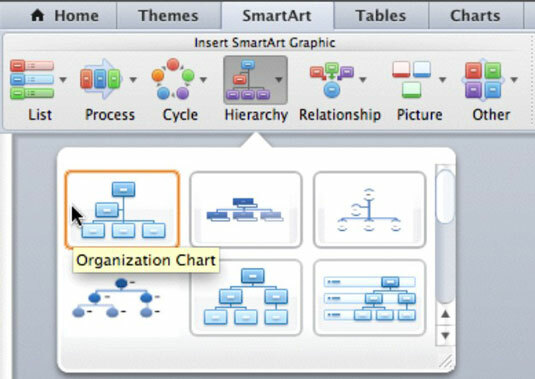 Access the SmartArt tab of the Ribbon and click any of the buttons in the Insert SmartArt Graphic group to reveal a gallery. To insert your choice, just click it. You can use arrow keys to move the selection cursor around on Ribbon galleries. Press the spacebar to insert the selected SmartArt graphic. Hover the mouse over a SmartArt variant within a gallery to see its name. Don’t be shocked at how large some of the galleries are. They’re designed so you can easily see the previews. Grab the resize handle at the lower-right corner and tame these monsters by dragging them down to size. As you do, scroll bars appear as needed. Text Pane: The Text Pane contains all the text content of a SmartArt graphic organized as an outline. Type in words within the Text Pane, and you’ll automatically find new shapes such as boxes that include the same text added within your SmartArt graphic. SmartArt shapes: SmartArt objects contain text boxes and other elements, usually with connector lines, constrained by a border that displays whenever you have selected your SmartArt object.